Halloween's over...unless you live in New Jersey, were the governor has decided it's Monday. My post today is the leftover goodies that I didn't get to show you because of Hurricane Sandy. Think of it as the clearance candy bin or those few Sugar Daddy pops left in your candy bowl. Once I swatched Revlon Wicked Star, I knew I'd found my green! The peachy gold shift reminded me of China Glaze No Plain Jane. They contrast until they suddenly match! 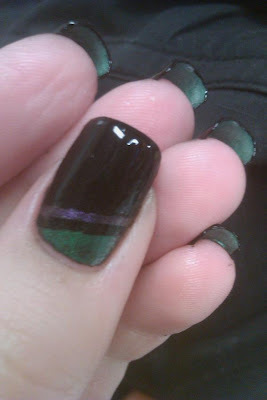 The undersides glowed (Fantasy Makers Go With The Glow), but my camera just WOULD NOT show it, no matter what I tried. Wicked Star worked its magic and made this mani one of my favorites, and worth the hell I went through in the week it took me to FINALLY get it to work. Bonus silliness....after the first couple steps they looked like eggplants! Not drastically shorter, but oh so much more comfortable...and no damn teabag patches! 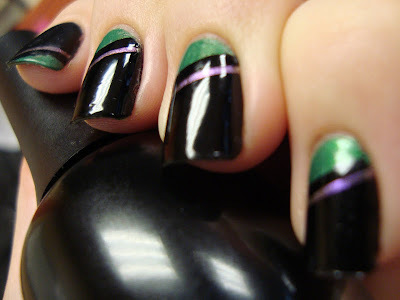 I'm happy that it kept my nails together so I could do this, but...that was excessive! Never again! I have to take a moment to say how great Finger Paints Black Expressionism is. Best black polish I've ever used...and I've tried sooooooo many! 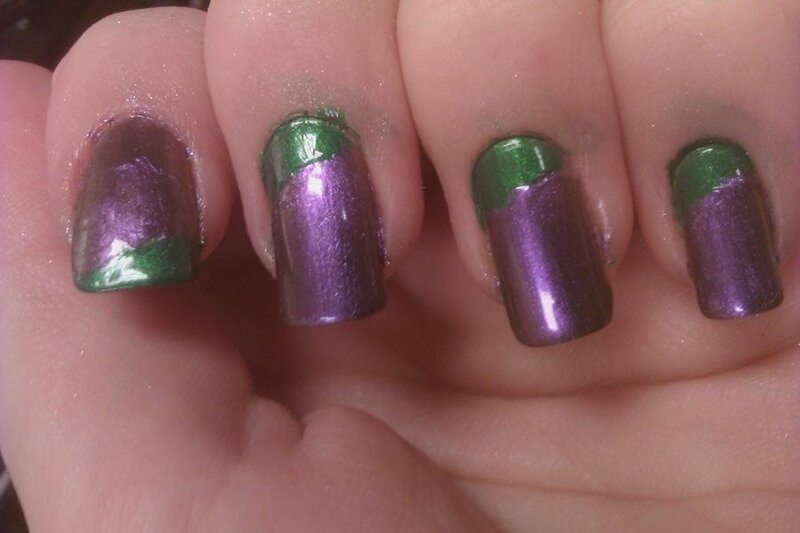 One coat (yes, really) for complete opacity and really shiny even without top coat! Love love love love looooove it!! So happy that the bubbling wasn't its fault! ...I have one final Halloween post tomorrow...thanks again, Sandy...and I hope everyone's ok!